Football clubs across Britain must urgently redress the "woeful" lack of facilities for disabled fans at many stadiums, says a government minister. Mike Penning, the disabilities minister, has written to every professional club in the country to highlight their legal obligations. "I'm blowing the whistle on discrimination against disabled people by football bosses," said Penning. 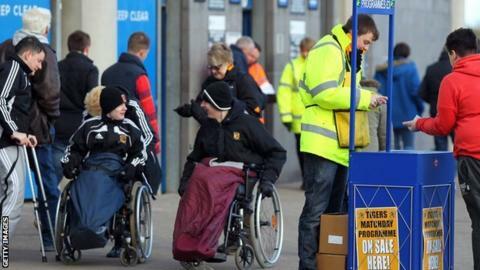 The Premier League says its clubs aim to provide good disabled facilities. "All Premier League clubs have arrangements in place to provide access and facilities for disabled fans," read a statement. "The highest standards of access are generally at clubs with new grounds, but all clubs, even those working within the constraints of older stadia, work hard to make sure that disabled fans can attend matches and enjoy their football." Penning has confirmed he wants to meet Football Association chairman Greg Dyke about the issue. Only last month, a BBC report revealed that only three Premier League stadiums provide the required number of wheelchair spaces. "The Government's involvement will add more pressure on clubs who are falling behind, but until this pressure is translated into specific legislation I can see little changing. "At present, clubs are required by equality law to treat all fans equally and ensure everyone can access their stadia. They are given guidance as to what they should do for disabled supporters and how many spaces they should provide but this isn't being followed. "The problem is that the clubs aren't being made to follow it, and neither the FA nor the Premier League has any rules telling them what the minimum standard should be. As a result, the experience of a disabled fan varies greatly from ground to ground. "Football showed in the wake of Hillsborough and the move to all-seater stadiums that it is capable of drastic action. However, until clubs are forced to follow these guidelines, wide-scale change in this case appears unlikely." Penning said a complete overhaul of grounds was required, "starting at the very top". He added: "The situation is currently woefully inadequate and it is not only wheelchair access that falls short, but access for people with all kinds of impairments." Guidelines on how football clubs in the UK should cater for disabled spectators have been in place since 2004. The Accessible Stadia Guide sets out minimum standards that all new grounds have to meet in the provision, location, and quality of facilities for disabled fans. The number of wheelchair spaces a stadium should provide is based on its capacity. Since the implementation of the Equality Act in 2010, and legislation dating back to 1995, it has been illegal for service providers, including football clubs, to treat disabled people less favourably than other customers. Clubs can be ordered to make reasonable adjustments, which can include providing induction loops for those with hearing impairments, audio-description facilities for those with sight impairments and free tickets for carers who accompany disabled fans at games. The Premier League insist they are following the existing regulations, and said: "The Accessible Stadia Guide sets out agreed standards to be achieved when new grounds are designed or existing grounds rebuilt, however all clubs use those standards to assess existing provisions and guide them on how to make improvements. "Particular attention is given to achieving stadium management solutions that make the best of the constraints and opportunities inherent in each stadium. This includes working with the fans to arrive at solutions that work for them, and providing special training for stewards and staff to ensure that appropriate assistance is given." Joyce Cook, chair of Level Playing Field, formerly known as the National Association of Disabled Supporters, added: "The experience of disabled football fans varies across the country. That's not acceptable and it's time all football clubs took their legal obligations seriously."